Interstate 80 near Floriston (though roaming on the T-Mobile network provides coverage in this area).– fixed Summer 2008. Hwy 89 south of Truckee to Tahoe City (though roaming on T-Mobile network provides some coverage along the route). The Zollezzi Lane /Arrowcreek Pkwy./ Thomas Creek Road foothills area (dropped calls, poor signal). 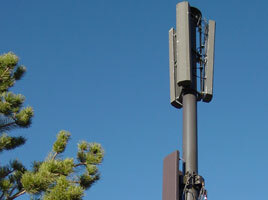 In early 2008 at&t installed a new cell site behind Wal-Mart on Damonte Ranch Pkwy and South Virginia Street, however it only improved coverage in an approximate 1 mile radius of Wal-Mart. The Damonte Ranch/South Meadows area east of Double R Blvd. and Damonte Ranch Pkwy. (dropped calls, poor signal). Bad hand-offs between cell sites resulting in dropped calls in the following areas: N. McCarran between Sutro St. and Evans Ave., N. McCarran near Keystone Ave., Hwy. 445 (Pyramid Lake Hwy) between Los Altos Pkwy and Queens Way. Poor coverage in the residential areas east of Vista Blvd. and Los Altos Pkwy. Poor coverage in central Sun Valley in the vicinity of Hobey’s Casino. Cingular always drops my calls on Hwy 431 (Mt. Rose Hwy) traveling between Thomas Creek Road and Fawn Lane. Ron: It looks like that area is “Partner” coverage provided by T-Mobile. It’s likely a bad hand-off from att/Cingular to T-Mobile or vise versa. My experience in the sub divisions in the South Meadows/Damonte area is usually no calls rather than dropped calls. Very frustrating and a long-standing problem. Why is it that my phone rarely works in the Double Diamond area? This area has grown so much, yet it seems no one on the AT&T network can get a signal out here. However Sprint happens to have a two towers down here. According to at&t, the cell tower located off of Trademark Drive and South Meadows was recently sold to T-Mobile. T-Mobile and at&t have signed an agreement and at&t will have a site located on that T-Mobile tower by the end of this year, 2007. Also at&t said they plan to offer the 3G service in the Reno/Sparks area by the 1st of 2008. Tanner: That tower was sold to T-Mobile at the same time all the other old Cingular 1900Mhz sites were transfered to T-Mobile as part of the agreement for Cingular to take over the old AT&T Wireless network in 2005. I haven’t seen any government permits yet to add at&t antennas and equipment to that tower on Trademark Drive, or anywhere in the South Meadows/Damonte Ranch area for that matter. I agree they definitely seem to be dragging their heels on providing good coverage in that area. In the past few weeks I’ve noticed that I’ve roamed on T-Mobile towers in several areas of town. Since there is no test mode on my Treo650, the only way I’ve been able to confirm this is a good signal strength in the area of a T-Mobile cell site, and the T-Mobile network uses a different kind of busy signal when calling a busy number. I heard from another at&t customer that was told that “high-speed internet” would be launched in November. He is currently using an EDGE laptop card. Time will tell. I have noticed that in the Wingfield springs area has weak coverage and almost all the way through the Los Altos pkwy develpment there is none. For At&t. AT&T Wireless is dead from 5 mile flat on Geiger Grade (this is where the turn out is) until Virginia City. The signal also fades from the top of Six Mile Canyon Rd in VC until you get to Dayton / Mark Twain. AT&T also has issues on the top of the hill from Carson City into Washoe Valley. no ATT service along highway 50 from glenbrook,nevada to round hill,nevada (east side of lake tahoe). Verizon just put a tower in at Glenbrook, can’t ATT piggyback? ATT iphone coverage at Somersett in the NW is very poor. My new iphone goes into no service mode and stays there. Only rebooting will get bars and usually about 1 bar. Phone waffles like a bad politician between Edge and 3G. Edge, 3G, 3G Edge. As Bryce mentioned, I always get dropped calls at the 395 exit (south end of Washoe Valley leaving Carson City) to Eastlake Blvd in Washoe Valley. Also have problems on Eastlake near teh 7-11. Calls dropping consistently today near Alexander Hamilton and Thomas Jefferson in southwest Reno. This is the worst coverage I’ve had in this area. I’m wondering if there is an equipment problem. Outgoing audio on my calls today has been dropping – all over town. I was unsure if it was just my phone. AT&T consistently drops calls on Mount Rose highway (431) around the vicinity of the Chevron station. Also, in the South Meadows residential area service is STILL bad, even after the addition of the new site by the Damonte Wal-Mart. Dropped calls, etc. Almost three months ago I switched from AT&T to T-Mobile. I had been with AT&T for 4.5 years. I live in Double Diamond and have found T-Mobile to provide much better coverage in this area, as well as providing excellent coverage around the rest of Reno/Sparks as well. AT&T is also good around most of Reno/Sparks, just not south Reno or Spanish Springs in my opinion. T-Mobile has the top position on both of the towers at the Damonte Ranch Wal-Mart and at Trademark/Wilbur May. After my experience with T-Mobile, I would highly recommend them to anyone having trouble with AT&T’s coverage in the Double Diamond/Damonte Ranch area. South Meadows area signal very weak where I make 90% of my calls from. MASSIVE dropped calls infuriating. I see on the map Sprint, T-Mobile and Cricket have a cell tower out here and AT&T does not. Ready to change carrier. I had the same problem on AT&T. T-Mobile has the top position on both of the South Meadows towers, by the Damonte Wal-Mart and the one by Trademark and Wilbur May. T-Mobile has worked much better for me in South Meadows. I never really had a problem with signal when I lived in South Meadows; neither have I had problems near Southtowne Wal-Mart. I’m having the biggest frustrations at Damonte Ranch though. I’m located just off of Veteran’s Pkwy close to Curti Ranch. It’s a real pain since my phone is my primary contact than my house phone. AT&T needs to step up with coverage. There shouldn’t be a reason why the “number one phone carrier” should have mediocre service in terms of cell phone coverage. I can’t understand why AT&T has a weak signal area in the South Meadows/Damonte Ranch areas? I thought AT&T recently added a site on the existing pole (along with Sprint, Cricket and T-Mobile) behind the Wal-Mart? With a 850Mhz signal, I would think the signal would travel well east of Double R Blvd! AT&T should fix this problem! I believe the reason that the signal does not travel far is because the AT&T antennas are so low on the pole (the bottom set of antennas) that the freeway to the east tends to block the signal somewhat. AT&T has room to move up and shound have done so initially. T-Mobile is on the top of this pole. Sprint is in the second position. Then Cricket. Then Clearwire. Last is AT&T. That makes sense to me! I know someone who lives in that new development east of 395 and his T-Mobile phone works pretty good. I think they need to erect a much taller tower. Had a weird experience over the weekend at the Reno Sparks Convention Center. I have a phone from AT&T and it reported 4 bars from inside the RSCC. But, when I tried to call a friend in the convention center, I couldn’t reach him. He later got a message and called me. But I didn’t get his call. Later, I got his voice mail. I had no problem with AT&T in the Peppermill, but the odd service in the convention center was frustrating. It’s not like my phone was dead…it was more in limbo. There’s a cell tower at Galena High School in South Reno (89511.) Web says Sprint. Can anyone confirm Sprint only or does this tower share? Anyone have the scoop on this tower?? Looking for a Verizon tower in So. Reno. Clearwire is also on that pole. 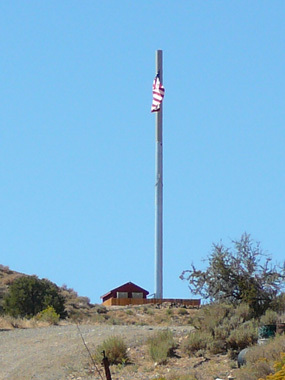 For Verizon, the Galena area is currently served by a tower on a hillside southeast of the 395/Mount Rose Junction. They are in the process of approval to co-locate on the tower behind the Damonte Ranch Wal-Mart. We live on Valmar Place about equidistant between McCarran, Kings Row, and Keystone. No signal at ground level, but some signal from the second floor. Numerous calls to AT&T have had the usual lack of meaningful response. It is hilly here and the nearest towers on the map are blocked. AT&T needs a tower above the intersection of McCarran and Keystone to cover this entire area. AT&T coverage in the Red Rock Road area north of Stead and into Rancho Haven/Sierra Ranchos are in nonexistent. We need a tower east of Red Rock Road on a mountain to cover that entire area. Anywhere north of Reno, into California, along 395 is very spotty. I visit the Doyle/Herlong area often and hardly ever have good enough service to make a phone call, let alone use the interent on my phone. It seems with all the building in process in the S Meadows/Double Diamond area that an additional Cell tower should be added to the AT&T network. Building permits indicate that they may have plans to convert the old Cricket CDMA site on the easternmost end of Trademark Drive to an AT&T site. T-Mobile & Verizon currently share the monopole. AT&T has a rough hand-off on upper Zolezzi near Thomas Creek. Almost always drops calls. Service anywhere east of Veterans is horrible, especially along Steamboat.